Recent revelations about the Rafale deal have all focused on one central question: Was the contract for 36 aircraft secured by the NDA government on better terms than the older UPA negotiations for 126 medium multi-role combat aircraft (MMRCA), especially with respect to cost and delivery time? Two documents made public Wednesday throw further light on these issues. The Hindu reproduced an eight-page dissenting note by three members of the Indian Negotiating Team (INT), claiming that the contract for the 36 aircraft was not on better terms. The CAG report tabled in Parliament, on the other hand, asserts that the government did manage to secure a better deal—but to a lesser extent than it claimed. In deference to the government’s wishes, the CAG report does not include any price details. Yet, there is enough in the public domain against which to match its conclusions. 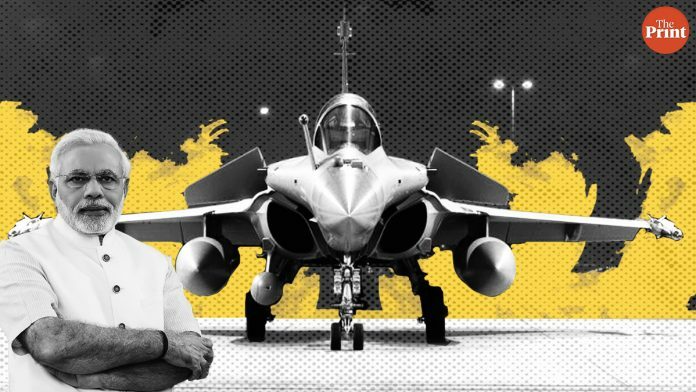 While the report adds significant details to the Rafale story, it also obfuscates crucial issues. The CAG report concludes that the overall price was “2.86 per cent lower than the Audit Aligned Price”. This aligned price was calculated by the CAG by extrapolating the cost of 36 aircraft from the original MMRCA bid for 126. The INT had adopted the same methodology in coming up with its own aligned price (although its benchmark price was lower). Was the bare aircraft cheaper? The CAG report notes that its aligned price for the bare-bones aircraft was the same as that computed by the INT. Further, it shows that the final cost of the bare aircraft in 2016 was essentially the same as both these calculations. These observations undercut PM Narendra Modi-led government’s previous claims on this issue. In a press briefing on 23 July 2018, Law Minister Ravi Shankar Prasad had said that the price of each bare aircraft in the 2016 contract was €91.75 million. This, he added, was 9 per cent lower than the price of €100.85 million quoted by Dassault Aviation when the MMRCA bid was opened in 2011. Prasad claimed that the figure of €100.85 million included the in-built escalation priced in by Dassault from its 2007 bid of €79.3 million. The CAG report shows that the INT had not worked with the figure of €100.85 million, but with an aligned cost of €91.75 million – a calculation with which the CAG agrees. So, the government’s claim of procuring the bare aircraft 9 per cent cheaper is misleading and incorrect. The CAG’s computation of the aligned price is dubious in one critical area: India-specific enhancements (ISEs) to the aircraft. This is important because the CAG claims that in this component the government saved 17.08 per cent over the aligned cost as computed by the auditor. Interestingly, here the CAG report does not compare its calculation of aligned costs with that of the INT. The latter was surely lower. Although the CAG report gives no costs, the figures have been in the public domain. In September 2016, Ajai Shukla reported that the average cost of each of the 36 bare aircraft was €91.7 million (in all, €3.3 billion). In addition, there were costs of ISEs (€1.7 billion), spares (€1.8 billion), logistics (€350 million) and weaponry (€700 million). Last month, The Hindu’s N. Ram reported that Dassault had quoted €1.4 billion as non-recurring costs (NRC) of design and development of ISEs and that this was eventually negotiated down to €1.3 billion in the 2016 deal. The CAG report informs us that in the MMRCA bid, Dassault had quoted a figure of €1.4 billion for ISEs. But in the negotiations leading up to the 2016 contract, Dassault had insisted that this was only the NRC and that there was an additional price to be paid for the equipment and integration of ISEs. The report also notes that the Contract Negotiating Committee for the original MMRCA bid had taken €1.4 billion “as the total price for ISEs inclusive of these elements”. There is nothing to suggest that Dassault had contested this interpretation at that time. In other words, although Dassault agreed in 2016 to reduce the NRC a bit (from €1.4 billion to €1.3 billion), there was a significant spike in the overall cost of ISEs from 2011. Yet the CAG claims that the government saved 17.08 per cent over the aligned cost as computed by the auditor. If the final amount paid for the ISEs is €1.7 billion, then the aligned cost calculated by the CAG works out to about €2.05 billion. Put differently, the CAG assumes that the cost of ISEs for 36 aircraft under the older deal would be around €2.05 billion – about €600 million higher than the figure quoted by Dassault in 2011. How did the CAG come up with this figure? Evidently by some combination of applying a cost escalation formula to the MMRCA figure and retrospectively adding costs of equipment and installation. In short, by accepting Dassault’s claims in 2015-16 at face value and by revising upwards the 2011 figure. This is precisely the point contested by the INT. As the dissenting note states, the INT felt that €1.4 billion for NRC was “exorbitant and unrealistic”. What is more, “The price has been further escalated (by Dassault) in the final offer and then reduced factoring in global discounts given by the French side”. Not only does the CAG overlook these facts, but it presents the outcome as cost saving to the government. This claim undergirds the report’s conclusion that on the whole, the 2016 contract was cheaper. More importantly, the CAG ignores the crucial point in plain sight. The ISE costs in the MMRCA were spread out over 126 aircraft. It is absurd to apply this cost in its entirety to a deal comprising just 36 aircraft and then claim that the final contract was cheaper in comparison. It only underlines the folly of going in for 36 aircraft without having thought through these issues—an error that could have been avoided had the decision not been imposed from on high. Consider next the question of a bank guarantee. We now know that the INT was keen to press for such a guarantee, but that the Ministry of Defence conveyed to the French that they were willing to settle for a (non-enforceable) Letter of Comfort. The CAG report notes that “this was actually a saving for M/s DA (Dassault) when compared to its previous offer of 2007”. The dissenting note states that the financial impact of the foregone bank guarantees was €574 million – without even factoring in the effect of escalation. It is interesting that the CAG does not take this figure into account while assessing the overall cost of the deal. Had the CAG report taken this logical step, its claim of the deal being cheaper would have been deflated. Would the jets be delivered faster? Lastly, the timing of delivery. The CAG claims that under the MMRCA bid, the first 18 aircraft were to be delivered between 37 and 50 months of the contract being signed. The next 18 would be delivered by HAL between 49 and 72 months of the contract. By contrast, under the 2016 contract, the first 18 would be delivered between 36 to 53 months and the next 18 by 67 months (including ISE by 71 months). Hence, the report claims that the current deal is faster by a month. However, as the INT dissent note observes, the right comparison is only between the time of delivery of the first 18 aircraft being supplied in a fly-away condition. More importantly, the delivery schedule committed to by the French government was “impractical”. Given the backlog of 83 Rafales, as well as the production rate of 8 aircraft per year, it was rather doubtful that Dassault would deliver on time. And without bank guarantees, there was no deterrent to delays on the part of Dassault. Unless further details on costs (including assumptions and estimates) and decision-making emerge, the 2016 Rafale deal will remain in question. The problem is they do not believe in any institution as long as it give some favourable judgement for PM Modi. All liberals wants to oppose it whatever will be the outcome. They want to create an election issue and like award wapsi was over after some state election this will go in the same way. Great…now even history professors are acquisition experts. There is no money trail, no inflated acquisition cost yet this trope does not end. Some idiots will always remain an idiot like this author. Who couldn’t care to read the report in full and listen to the IAF person guy who headed the negotiations. It’s there is no cure for stupidity. Neither the somewhat hurried apex court judgment nor the CAG report has succeeded in laying the controversy to rest. Although the ISEs are not in the public domain, there would not be a single responsible commentator – apart from the governments of China and Pakistan – who is not aware of them. That the issue will be part of the general election campaign is not in doubt. 2. When the apex court takes up the government’s request for a modification of its judgment- to correct grammatical errors – and the more substantive plea made by the petitioners, it may be pleased to consider all the material that is now being brought into the public domain, which is essentially the official record of this case, and pass suitable orders.